The coming Budget 2013 is expected to address two interesting issues - how to curb the speculative property market and how to address the issue of affordable housing. In a recent report, Kenanga Research says market talk is that the Government will consider hikes in real property gains tax (RPGT) and increase stamp duty for house purchases. The research unit opines that Budget 2013 measures will likely address the affordable housing segment such as the 1Malaysia People's Housing (PR1MA) and My First Home schemes. However, the research unit says across-the-board hike in buyers stamp duty is unlikely as it will hurt the first-time home owners' market, unless the stamp duty hikes are tiered according to house prices and first home-ownership status. Last month, Housing and Local Government Minister Datuk Seri Chor Chee Heung said the Government would not hesitate to tighten fiscal policies to curb property speculation, and ensure reasonable and affordable property prices. He noted that most Malaysians felt property prices were “far too high” and wanted the Government to look into this. During the 15th National Housing and Property Summit, Chor said the Government was expected to allocate more affordable housing projects such as the People's Housing Project (PPR) and PR1MA in the coming budget. He added that the maximum household income of RM2,500 eligibility for PPR houses might be too low nowadays. “Perhaps the maximum eligible household income for PPR houses can be increased to RM3,000,” Chor said. Rising prices and affordability are issues being grappled by the Government and the private sector. It should be noted that the Real Estate and Housing Developers' Association (Rehda) has proposed measures for Budget 2013 that are aimed at reducing business costs for property developers in order for property prices to be managed at more affordable levels eventually. Rehda has proposed that private utility companies should not be imposing capital contribution charges on property developers, which are presently required to lay infrastructure in their projects. Rehda points out that the duty of providing infrastructure such as sewage treatment plants and surrendering land for power substations add to development costs. Based on its research, compliance costs payable to various authorities can be as high as 30% of the selling price of the housing units. “All these contributions imposed on developers would eventually be passed on to buyers, thus increasing the prices of properties,” REHDA says. Rehda has also proposed that developers be relieved from the role of providing low-cost housing, as well as an automatic release mechanism for unsold bumiputra units to the open market (50% of unsold bumiputra units to be released after six months from the sales launching date, 25% to be released after 12 months and the balance 25% to be released after 18 months). Rehda has also asked for a reduction of stamp duty rates for property transfers, which the association says would help to lower the costs of home ownership, encourage house purchases and help sustain home affordability levels. It was noted that the majority of annual residential property transactions were below RM300,000 (more than 78% in 2012, and more than 75% in 2011). However, National House Buyers Association (HBA) secretary-general Chang Kim Loong tells StarBizWeek that there should be hikes in the RPGT and stamp duty rates, in order to curb excessive speculation in the property market. HBA has proposed that RPGT be increased to 30% for the first two properties sold within two years after acquistion or completion (whichever is later). HBA has also proposed that for the third and subsequent properties sold within 10 years, RPGT should be at 30%. HBA also wants the current stamp duty rates to be maintained for the first two properties. However, HBA has proposed that stamp duty rates to be increased to 5% of the purchase price for the third property, 7.5% for the fourth unit, and 10% for the fifth and subsequent properties. To further curb property speculation, HBA also proposed tighter lending guidelines by imposing a maximum loan-to-value (LTV) ratio of 60% for the fourth housing loan, and a maximum LTV ratio of 50% for the fifth and subsequent house financing facilities. Chang says HBA's proposals will not punish genuine house buyers, or those who buy for long-term investments, or to fund their children's education. He also says HBA sent numerous proposals to the Government to increase the supply of affordable housing. Chang also voiced his concerns about vested interests lobbying to build commercial properties such as shopping complexes and high-end properties when the government unlocks its land bank. He has also asked for more incentives for property developers who build affordable properties such as lower tax rates. “Incentives for lower income earners to buy their first property can include preferential interest rates,” he says. Chang also opines that there is currently a huge mismatch between what the average household income can afford compared with what is available in the market. “A homeless generation will emerge to create various social problems,” he says. Based on HBA's estimates, he says families with a monthly income of less than RM3,000 a month can only afford a house which costs less than RM150,000 while those with a monthly income of up to RM6,000 can only afford a house which costs less than RM300,000. The concerns surrounding affordable housing was brought up by Deputy Finance Minister Datuk Donald Lim Siang Chai who recently said that affordable housing would be a Budget 2013 highlight. Lim says the Government had proposed to increase the limit of house prices under the My First Home scheme from RM220,000 to RM400,000 to fulfill the needs of those earning below RM3,000. Property consultancy CB Richard Ellis (M) Sdn Bhd executive director Paul Khong says that increasing the limit of house prices under the My First Home scheme to RM400,000 for purchases within Klang Valley and Penang may be more relevant in today's scenario. “House prices have moved up substantially over the last three years. The amount of up to RM220,000 may not be too meaningful especially for residential properties within the Klang Valley areas,” says Khong. 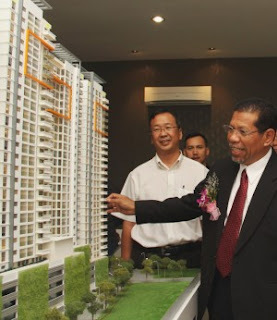 It’s official: Ahmad Phesal (right) checking out the Bayu Sentul condominium model after the launch. The Kuala Lumpur City Hall (DBKL) is looking at the possibility of having more affordable houses for the middle-income group, said mayor Datuk Ahmad Phesal Talib. He said two projects proposed to DBKL were under consideration as there was a growing demand for them. “One of the projects has units priced at RM400,000 each and we want to see if the price can be reduced, while the developer of the other project is looking at having a 50:50 variation of high-end and medium-cost units. “These projects will be the pioneers in the city targetted at middle-income earners and we hope to cap the unit price at below RM400,000. “We realise the rich can afford to buy the high-end properties while the lower-income group can apply for PPR or low-cost units. But people in the middle-income group do not seem to have many options open to them. “We have a special taskforce to oversee this matter so the younger generation will be able to live in Kuala Lumpur and afford these homes via joint loans,” he said after handing over keys to owners of units in Sentul Utama condominium block C and D in Sentul, Kuala Lumpur. It was a long wait for the owners. The condominium project declared abandoned in 1997 by Housing and Local Government Ministry (KPKT) involved 680 units. It was to be completed in 1999 but the developer halted the project due to the 1997 financial crisis. There were also problems with the relocation of squatters, which affected the progress of the project. However, after 15 years, in a joint effort by KPKT, DBKL and the Federal Territories and Urban Wellbeing Ministry, the project was completed and the Certificate of Fitness for occupation were issued. The project was revived and completed by the new management — Sentul Murni Sdn Bhd, which retained the selling price of RM90,000 per unit. Now, the market price for each unit is said to be RM300,000 per unit. Ahmad Phesal applauded the developer for their commitment in completing the project. “The revival of abandoned projects needs the combined effort of relevant stakeholders, and we need to look at the percentage of having low and medium-cost developments. “As these projects come under KPKT, DBKL will assist to get these projects completed sooner,” he said. During the event, Ahmad Phesal also launched the Bayu Sentul, a 360-unit condominium on a 0.963ha plot of land. The Malaysian Institute of Estate Agents (MIEA) wants to encourage more participants outside the Klang Valley area for its upcoming Real Estate Awards next month. MIEA deputy president and awards chairman Siva Shanker points out that one of the awards categories, the prestigious “Real Estate Agency of the Year,” is open to participants where the MIEA has a state branch, namely Penang, Perak, Johor, Sabah and Sarawak. “In first three years when we held the awards, we had strong response from estate agencies from Kuala Lumpur but not from other states. It's because they (agencies outside Kuala Lumpur) felt that they can't compete,” he tells StarBizWeek in an interview. Siva adds that many agencies outside the Klang Valley were reluctant to participate because there was just no comparison in terms of the quantum of the transaction. To address this issue, awards under the Real Estate Agency of the Year category is now judged based on individual states. “This is the second year we're doing it and the MIEA wants to encourage participation from estate agents from outside the Klang Valley area,” Siva reiterates. This year's Real Estate Awards, which is being organised for the fourth consecutive year by the MIEA, will be held on Oct 6 at the Sime Darby Convention Centre in Kuala Lumpur. There will be a total of eight award categories three for Agency (which is divided into small, medium and large firms), a Salesperson award, Specialised Category, Real Estate Agent of the Year, Real Estate Agency of the Year and Real Estate Agency of the Year State Branches. The eight award categories are further broken down into 22 sub categories. “We've broken up the awards based on the size of the agency, namely small (less than 20 agents), medium (21 to 100 agents) and large (above 100 agents) firms. “We want to make a difference based on the size of the company. We don't want a large firm doing RM50mil worth of businesses competing against a smaller agency handling a lower quantum of work,” says Siva. He also says awards for agents are divided into work for the residential, commercial and industrial sub-sectors. “There's also a Specialised Category to cater for work that does not fall under the residential, commercial or industrial sub-sectors. This may include an abandoned development that has been revived, successfully putting together a difficult joint venture or selling an island, for instance. Siva says there will also be special award category, namely the Real Estate Leadership Award, which will be by invitation only and reserved for selected, privileged individuals within the property industry. “The Real Estate Leadership award is decided by the MIEA council of management. The recipient could be a valuer, developer or anyone within the property industry. Past recipients of the Real Estate Leadership award were Senator Datuk Abdul Rahim Rahman, the executive chairman of Rahim & Co group of companies, former Valuation Department director-general Datuk Ravindra Dass and Bukit Kiara Properties group chairman Datuk Alan Tong. 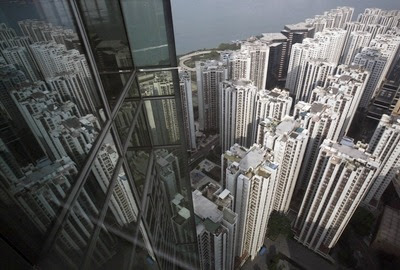 HONG KONG: The latest stimulus from the US Federal Reserve increases the risk that Hong Kong's redhot property market will overheat and authorities may act to deal with that at an “appropriate” time, Hong Kong's de facto central bank said. The Federal Reserve kicked off another aggressive stimulus programme on Thursday, known as QE3, saying it would pump US$40bil into the. economy each month until it saw a sustained upturn in the weak jobs market. Hong Kong, with one of the world's most open economies and a property market that is easy to enter, has low transaction costs and no capital gains tax. That makes the city's housing market a popular target for “hot money” when liquidity enters the global economy, as expected with QE3. “Due to the launch of QE3 and as the risks of the euro debt crisis calm down, the chance of an overheating asset market in Hong Kong is escalating, so we will introduce suitable measures at the appropriate time,” Norman Chan, chief of the Hong Kong Monetary Authority, told reporters. “The risk of an overheating property market also suggests a potential asset bubble,” Chan added. Chan said he did not expect the US measures would put significant pressure on Hong Kong's low interbank interest rates. Hong Kong's interest rates are linked to those in the United States because the Hong Kong dollar is pegged to the greenback. Chan reiterated that the Hong Kong government had no plan to change the Hong Kong dollar's peg to the US currency.